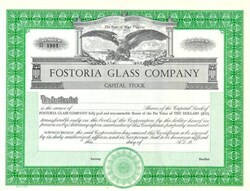 Beautiful unissued Stock Certificate from the famous Fostoria Glass Company . This historic document was printed by the Goes Company and has an ornate border around it with a vignette of an eagle. The Fostoria Glass Company began operations in Fostoria Ohio, on December 15,1887. This site was chosen because natural gas at a recently opened field in the area had been offered at a very low cost to attract new industries. However, the field was so short-lived that in 1891, Fostoria moved to Moundsville, West Virginia, where there was an abundance of gas, coal, and the other needed materials close by. During its first ten years, Fostoria made pressed ware, but early in the century Fostoria realized the importance of developing fine quality blown stemware, lamps, and other decorative accessory pieces. In 1924 the company was one of the first to start a program of national advertising, and the first to produce complete dinner services in crystal. Besides their regular line of blown , etched and pressed patterns they did custom work, such as providing glass with government seals for officials in Washington. All the presidents from Eisenhower through Reagan ordered glassware from them. At one time Fostoria was the largest maker of handmade glassware in the United States, employing nearly one thousand people. The AMERICAN pattern, introduced in 1915, is still being produced by Lancaster Colony(who bought the Fostoria Company in 1983), making it the most successful pattern in the history of glassmaking. Fostoria's business peaked in 1950 when they made over 8 million pieces of glass. In 1986 after struggling with an outmoded plant and foreign competition, Lancaster Colony was forced to close the Fostoria factory, ending nearly 100 years of glass making.